These three images of Io in eclipse (top) show volcanic hot spots and airglow associated with volcanic plumes and Io's atmosphere. They were acquired by NASA's Galileo spacecraft during three separate orbits of Jupiter when the moon was in Jupiter's shadow. Brightnesses are color-coded from red which displays the highest intensity to dark blue which displays zero intensity (no light). 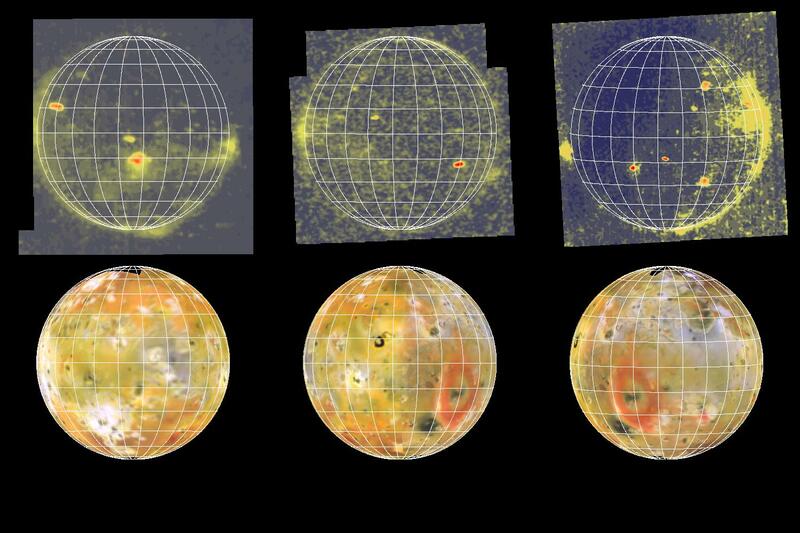 Below them are the corresponding views of Io in reflected sunlight, reprojected from a global mosaic of images obtained during Galileo's first and second orbits of Jupiter. 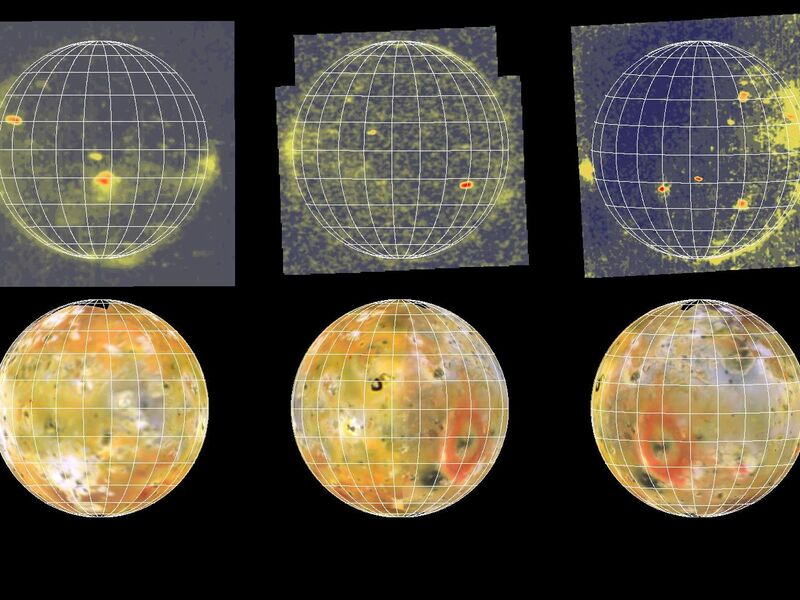 These lit views help to identify the locations of the hot spots seen in the eclipse images. The grid marks are at 15 degree intervals of latitude and longitude. North is to the top. 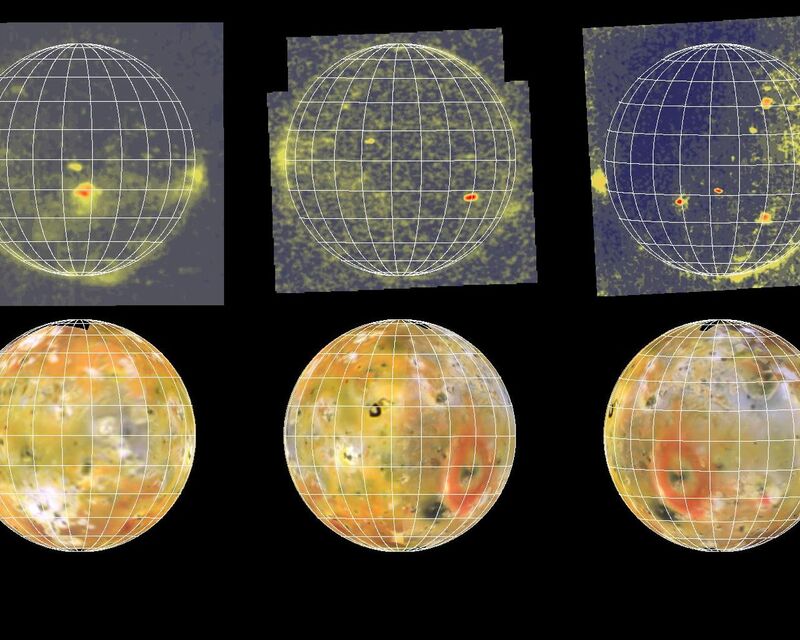 In the eclipse images (top) small red ovals and perhaps some small green areas are due to thermal emission from volcanic hot spots with temperatures hotter than about 700 kelvin (about 1000 degrees Fahrenheit). 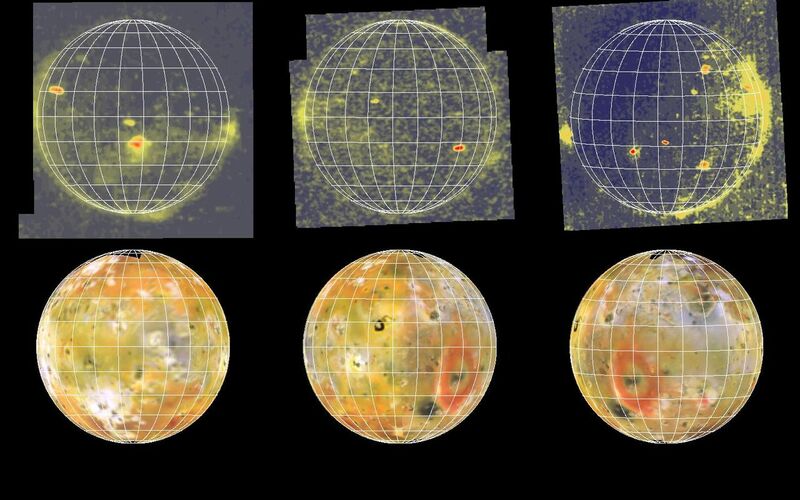 Diffuse greenish areas seen near the limb or edge of the moon are probably the result of auroral and/or airglow emissions of neutral species of oxygen or sulfur in volcanic plumes and in Io's patchy atmosphere. All images were acquired by the solid state imaging (CCD) system on NASA's Galileo spacecraft. The top left image was obtained during the spacecraft's fourth orbit (E4) on December 17, 1996, the top middle image during the sixth orbit (E6) on February 21, 1997, and the top right image during the first orbit (G1) on June 29th, 1996. The relatively long exposures used to obtain these eclipse images lead to some smearing of the picture elements which reduces the actual resolution. Unsmeared they would have resolutions of 17.6, 9.1, and 10.5 kilometers per picture element respectively (left to right). Temperature and Area Constraints of the South Volund Volcano on Io from the NIMS and SSI Instruments during the Galileo G1 Orbit, by A.G. Davies, A.S. McEwen, R. Lopes-Gautier, L. Keszthelyi, R.W. Carlson and W.D. Smythe. High-temperature hot spots on Io as seen by the Galileo Solid-State Imaging (SSI) experiment, by A. McEwen, D. Simonelli, D. Senske, K. Klassen, L. Keszthelyi, T. Johnson, P. Geissler, M. Carr, and M. Belton. Io: Galileo evidence for major variations in regolith properties, by D. Simonelli, J. Veverka, and A. McEwen.